Though they may not yet be old enough to vote, our students still find important opportunities for their voice in politics. They are well aware of the social issues that await their generation; but rather than see themselves as victims of the challenges that await, our students push themselves to engage in potential solutions– to deeply understand the world around them and to develop action plans that will bring about meaningful change. 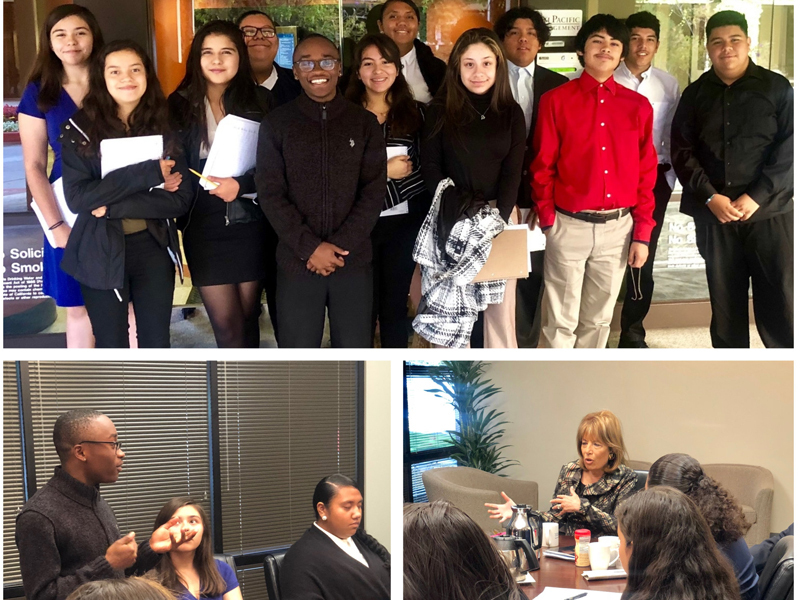 As a part of that work, a group of Oxford Day Academy students met last month with our neighborhood’s US Representative, Congresswoman Jackie Speier, to discuss their thoughts on what policies are needed most. Discussing issues from women’s rights, to structural racism, to affordable housing, to bullying, our students used this opportunity to make sure their voice would be heard in next week’s midterm election. What is your purpose when teaching my Polynesian child? What are your intentions? What standards do my child have to meet in order to be treated or be seen as an equal to their classmates? Before you decide who my child is by the way she looks, let me tell you that every individual that walks this earth is different in their own unique way. Let me ask you if my child’s brown skin color is going to be an issue in your classroom. If her skin color will determine whether she fails or succeeds, whether she’s smart or dumb, or whether she’s pretty or ugly. Are you aware that my child comes from a separate culture from yours? She was raised to be well respected, well mannered, and to never look down on others because everyone shares a different story. She was raised to respect her elders and be a light to others around her. Know that my child had a rough childhood. She has always been around drugs, alcohol, and violence most of her life. She lost her baby brother at a young age and then she was hospitalized for three months, but she fought to stay strong for her family because she knew that someone else in the world was going through more pain then her. She’s experienced multiple things in her childhood that affect her to this day. She shows little affection, cannot easily trust others, and is triggered by certain things that remind her of other things that she had to erase from her memory. She doesn’t want her personal problems affecting her relationships with others or getting in the way of her education or of her fulfilling her purpose in life. Know that my child has a great personality and hates being compared to others. Know that my child loves to observe her surroundings and how other people are feeling towards her. She can be very stubborn at times, but knows her limits. Know that she has always been doubted and told she can never make it anywhere in life. And, because of this, she loves putting others first. She loves caring for people, because she knows everyone has a purpose in life and that at times, they either need support finding it, or fulfilling it. Know that my child is able to dress herself, cook, clean, and take care of herself, without adult supervision. Know that my child has raised her four younger cousins when her cousins’ parents were going through a difficult time in life. She has always tried to be there for her cousins, parents, siblings, school, and have time to talk to God, while still trying to keep her life balanced. I ask you politely, do not underestimate my daughter because of her background and culture. Please do not look down upon her because her skin color is darker than the color white. Please end the mistreatment, stereotypes, and assumptions made on people of color. Will you help my child lead a successful life or will you teach her what failure feels like? Will you leave my child behind or make sure she is always on the same page? Will you teach my child about equality or division? Will you teach my child how to give up on herself and doubt her purpose in life? Respect my child, she is a human being too. No limits to her personality. She is very aware that the world is full of different colors.